The Pittsburgh Courier was established in 1907 by Edwin Harleston, an aspiring writer and security guard at the H.J. Heinz food packing plant. The Courier achieved national prominence after attorney Robert Lee Vann joined the newspaper in 1910. Vann’s original position at the Courier was that of legal counsel, but he soon took control as the paper’s editor-publisher and treasurer. Under Vann’s guidance the Courier called for improvements for African Americans in areas such as housing, education, and health care. A primary goal of the Courier was to empower blacks both economically and politically. Articles and editorials encouraged the black community’s support of organizations such as The National Association for the Advancement of Colored People and The National Urban League. In the 1930’s the Courier sparked a nationwide protest against the Amos ’n’ Andy radio program when it denounced the stereotypical negative portrayals of African Americans on the show. 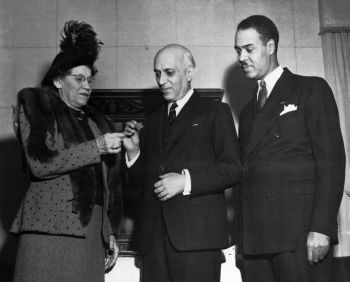 Vann and the Courier were instrumental in influencing black voters to shift their political allegiance away from the Republican Party in the 1932 presidential election. At the time, many African Americans still thought of the Republicans as the party of Abraham Lincoln and remained loyal to the party because of black enfranchisement. But Vann used his influence to convince black voters to instead support the Democratic candidate Franklin D. Roosevelt and his New Deal programs. Before his death in 1940, Vann saw the Courier grow into a powerful voice for African Americans with offices in 14 American cities and a weekly circulation of 250,000. Ira Lewis assumed the position of editor at the Courier after Vann’s death. Lewis had worked at the paper since 1914 and was chosen by Vann to be his successor. Under Lewis’ leadership the Courier maintained its commitments to the black community and reached new highs in circulation, popularity and scope. During World War II, the Courier launched the political fight for which it is most famous, the “Double V” campaign. It began when the Courier printed a letter it received from a 26-year-old African American man from Wichita, Kansas named James G. Thompson. In his letter, Thompson demanded that African Americans who were fighting for their country overseas receive full citizenship rights at home. The Courier designed a recognizable logo (The Double V theme read: Democracy: Victory at Home, Victory Abroad) to promote the campaign and it soon became a nationwide effort as it was endorsed by other black newspapers. Another of the many political battles fought by the Courier was against segregation in professional sports. Wendell Smith, the paper’s sportswriter, used his column to denounce Major League Baseball’s policy of excluding blacks. His efforts were a contributing factor when Jackie Robinson broke “the color barrier” and signed with the Brooklyn (New York) Dodgers in 1947. Ira Lewis died in 1948. During the 1950’s and 1960’s, the Courier’s circulation began to steadily decline. As a result, it was sold in 1965 to the owner of the Chicago Defender in Illinois, Robert Stengstacke, and added to his national chain of newspapers. The Pittsburgh Courier is now published under the name The New Pittsburgh Courier. Andrew Buni, Robert L. Vann of the Pittsburgh Courier (Pittsburgh, Pennsylvania: University of Pittsburgh Press, 1974); Aurora Wallace, Newspapers and the Making of Modern America (Westport, Connecticut: Greenwood Press, 2005); http://www.pbs.org/blackpress/news_bios/courier.html.